I have not posted about my weight loss journey in awhile and with swimsuit weather here I thought I would give you a quick update. I’ve now lost almost 40lbs and reached my goal. These last 5 pounds are always the trickiest. I think all those “diet” desserts and snacks I keep buying are doing me in. On a recent trip to my parents without my Fat Free Cool Whip and Skinny Cow ice cream I magically lost 3lbs. My guess is that it was my lack of diet desserts. Calories are calories after all. Since we last chatted I have added bike riding to my exercise routine. 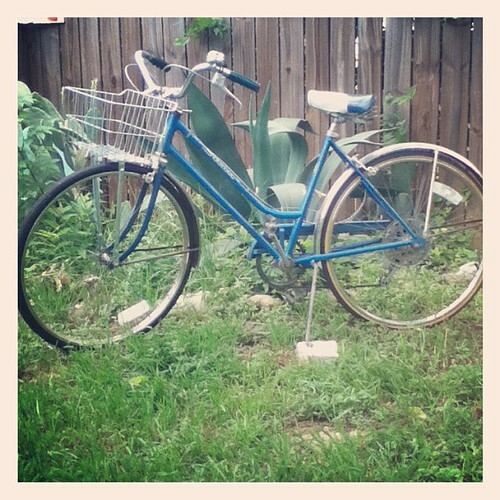 I aired up the tires on my vintage Schwinn that I have had since childhood and started taking this baby out for a few spins. Oddly, riding my bike feels harder than jogging some days. Man it kills the tops of my thighs, but I guess that is a good thing. It seems unfair that a 4.69 mile ride only burns 133 calories. I am still doing my pod cast from Running Mate. Currently I am on week 6. This week I do a 5 minute warm up walk, jog for 12 minutes, walk for 3 minutes, jog for 12 minutes and then a cool down 5 minute walk. This ends up coming to 3.2 miles in 40 minutes and roughly burns 312 calories. The heat is starting to get to me so I have switched from running at 8pm to 8am. Next on the agenda is a summer full of swim lessons with the kids, cashing in some rock climbing passes with my mom’s group and a 5 pack of Bikram Yoga classes, because you know it is not hot enough in Texas as it is. We are still having a box of veggies delivered weekly, but I must admit the novelty is wearing off. A box of squash, cabbage and potatoes does not seem as appealing to me as the fresh asparagus and artichokes I am seeing at the grocery store. Either way it is forcing me to find creative uses for things like patty pan squash. I made up a yummy and low cal recipe I thought I would share. 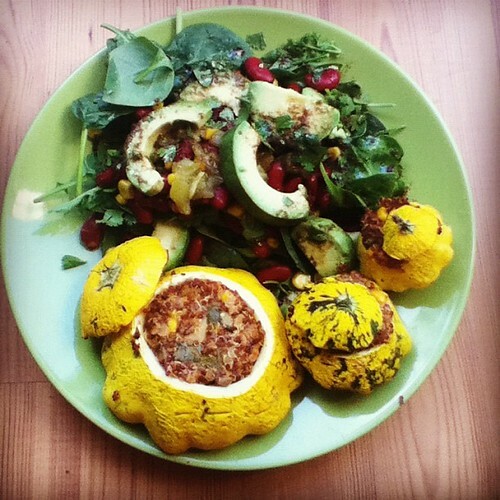 Cut the pattypan squash in half along the equator. Scoop out the seeds in the middle and discard. Scoop out the flesh without busting through the sides. Chop up the insides and set aside. While your empty squash vessels are baking cook your quinoa according to package directions and set aside. So now squash is baking and quinoa is cooking – time to saute! Using a cooking spray or a non stick skillet saute your onions and squash guts. You want the onions to be clear and the squash to be soft. In a large bowl combine everything but the squash shells. Add salt and pepper to taste. Remove your squash from the oven when they are done and fill with mixture. You will have a lot of stuffing left. We froze ours and I intend to top a future salad with it. Replace the squash lids and put back into 350 oven for 15 minutes or so. If your filling is still hot from just making it this should not take long. Remove from oven, serve with a giant salad covered with beans and avocado and enjoy! Posted June 4, 2012 & filed under Cooking Crafts, Weight Loss. That looks delicious. I've never had that kind of squash before. I'm trying to make more heathy meals for our family and I think this would be s crowd pleaser.